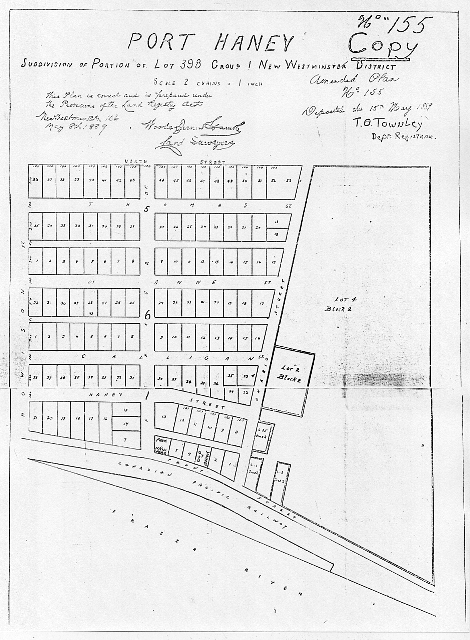 Port Haney was named after Thomas Haney who owned the entire townsite as well as a large piece of land on the top of the hill behind Port Haney, extending all the way to the Dewdney Trunk Road. Haney purchased the land then known as Wickwire’s Landing in 1879 – just five years after incorporation. In the early 1880’s, Thomas became aware of the CPR plans and submitted an application to Victoria for a townsite. He laid out a grid of streets named after members of his family and nearby neighbours. This townsite was soon to become the commercial heart of the community with a growing variety of businesses and services. Its location at a nexus of transportation – river, rail, and road – meant that Port Haney soon became a centre for heavy industry. Its natural clay resources meant that brickworks could be established and their product shipped by water or rail to New Westminster, Victoria and beyond. View archival photographs of Port Haney on our Flickr site.